WHAT IS OWED TO THE SERBS. One of those moments you never forget: 18 years ago, before the dawn on March 25, 1999, I stepped outside the door to find The New York Times there on the ground with the headline announcing that NATO had begun its bombing campaign against the Serbs in the former Yugoslavia on March 24, 1999. I remember looking at that front page of the paper before picking it up and thinking - "They are really doing it... It's no longer a threat... It's real... It's real... What a mistake... What a mistake..." Then I picked up the paper and went back inside. So began a cruel 78 bombing campaign against Serbia, by the NATO allies, which included the time span over the Easter holiday and my family's Christian Patron Saint's Day - our Krsna Slava, St. Lazarus Saturday - which falls a week before Serbian Orthodox Easter. I love America. Always have. Always will. But that bombing campaign in the Spring of 1999, yet another horrific mistep in American foreign policy against the Christian Serbs that had spanned throughout the decade of the 1990s beginning with the break-up of the former Yugoslavia, was a mistake of GIANT proportions. The Serbians had always been one of America's most steadfast and loyal Allies and certainly her best friend in the Balkans for sure. What hurts the most is that now so many Serbians no longer consider America a friend or an ally and have no wish to be either of those to America. That is the real tragedy. The WRONG people were targeted. The WRONG people were punished. The WRONG people in the Balkans were alienated. 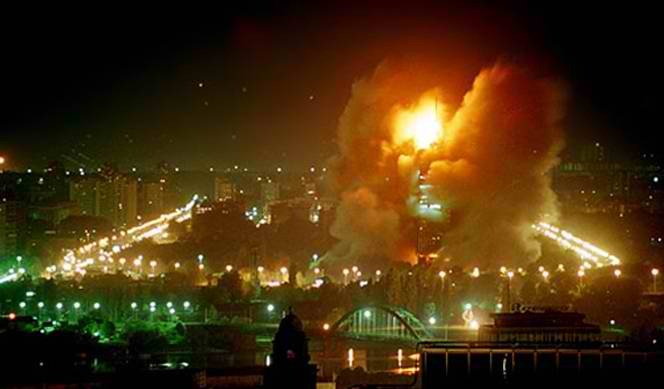 The NATO bombing campaign of 1999 against the Serbs stands as one of the most unjust acts of aggression in the history of the world. I can only hope and pray that, at the very least, some day there will be a public act of contrition in the form of a public apology from America, regardless of whether there is one from her NATO allies or not, and that this apology will resound for all the world to hear. AMERICA OWES SERBIA THAT ACT OF REPENTANCE, AND MUCH MORE.